S. Pierre Yameogo is a Burkinabé film director and screenwriter. He has directed six films since 1987. His film Delwende was screened in the Un Certain Regard section at the 2005 Cannes Film Festival where it won the Prize of Hope award. Idrissa Ouédraogo was a Burkinabé filmmaker. His work often explored the conflict between rural and city life and tradition and modernity in his native Burkina Faso and elsewhere in Africa. He is best known for his feature film Tilaï, which won the Grand Prix at the 1990 Cannes Film Festival and Samba Traoré (1993), which was nominated for the Silver Bear award at the 43rd Berlin International Film Festival. Nobody Knows is a 2004 Japanese drama film based on the 1988 Sugamo child abandonment case. The film is written, produced, and directed by Hirokazu Kore-eda, and it stars actors Yūya Yagira, Ayu Kitaura, Hiei Kimura. The Best of Youth, is a 2003 Italian film directed by Marco Tullio Giordana. Originally planned as a four-part mini-series, it was presented at the 2003 Cannes Film Festival where it won the Un Certain Regard award. It was then given a theatrical release in Italy in two three-hour parts in which 40 minutes were edited out. The complete version was aired in Italy from December 7 to 15, 2003 on Rai Uno in four parts. Salaam Bombay! is a 1988 Indian film written and directed by Mira Nair, and screenwritten by her longtime creative collaborator, Sooni Taraporevala. The film chronicles the day-to-day life of children living in the slums of Bombay, India's biggest city. It stars Shafiq Syed, Hansa Vithal, Chanda Sharma, Raghuvir Yadav, Anita Kanwar, Nana Patekar and Irrfan Khan. 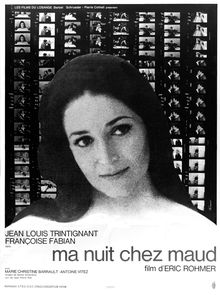 My Night at Maud's, also known as My Night with Maud (UK), is a 1969 French New Wave drama film by Éric Rohmer. It is the third film in his series of Six Moral Tales. The Marquise of O is a 1976 film directed by Éric Rohmer. Set in 1799, it tells the story of the Marquise von O, a virtuous widow, who finds herself pregnant and protests her innocence while possibly deserving to be exiled. The film was inspired by Heinrich von Kleist's 1808 novella Die Marquise von O. The film won the Grand Prix Spécial Prize at the 1976 Cannes Film Festival. Moolaadé is a 2004 film by the Senegalese writer and director Ousmane Sembène. It addresses the subject of female genital mutilation, a common practice in a number of African countries, from Egypt to Nigeria. The film was a co-production between companies from several Francophone nations: Senegal, France, Burkina Faso, Cameroon, Morocco, and Tunisia. It was filmed in the remote village of Djerrisso, Burkina Faso. The film argues strongly against the practice, depicting a village woman, Collé, who uses moolaadé to protect a group of girls. She is opposed by the villagers who believe in the necessity of female genital cutting, which they call "purification". The Edge of Heaven is a 2007 Turkish-German drama written and directed by Fatih Akın. The film won the Prix du scénario at the 2007 Cannes Film Festival, was Germany's entry in the category Best Foreign Language Film at the 2007 Oscars, but was not nominated. Bintou is a 2001 Burkinabé short film directed by Fanta Régina Nacro. It formed part of the 2002 collection Mama Africa. Buud Yam is a 1997 Burkinabé historical drama film written and directed by Gaston Kaboré. It is the sequel to the film Wend Kuuni. As of 2001, it was the most popular African film ever in Burkina Faso. Father of My Children is a 2009 French drama film directed by Mia Hansen-Løve. It won the Jury Special Prize in the Un Certain Regard section at the 2009 Cannes Film Festival. It is based in part on the life of the late Humbert Balsan. Cut Nyak Dhien or Tjoet Nja' Dhien was a leader of the Acehnese guerrilla forces during the Aceh War. Following the death of her husband Teuku Umar, she led guerrilla actions against the Dutch for 25 years. She was posthumously awarded the title of National Hero of Indonesia on May 2, 1964 by the Indonesian government. Muna Moto is a 1975 Cameroonian drama film written and directed by Jean-Pierre Dikongué Pipa. The Hunt is a 2012 Danish drama film directed by Thomas Vinterberg and starring Mads Mikkelsen. The story is set in a small Danish village around Christmas, and follows a man who becomes the target of mass hysteria after being wrongly accused of sexually abusing a child in his kindergarten class. Raja Amari is a Tunisian film director and script writer. She is best known for her films Satin Rouge/Red Satin (2002), and Dowaha/Les Secrets/Buried Secrets (2009), both of which have earned international awards and recognition. The Past is a 2013 French–Italian–Iranian drama film, written and directed by Iranian director Asghar Farhadi and starring Bérénice Bejo, Tahar Rahim and Ali Mosaffa. ↑ "Festival de Cannes: Delwende". 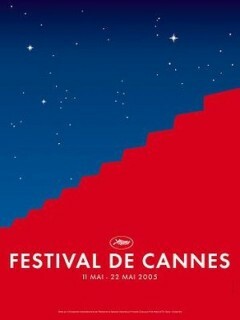 festival-cannes.com. Archived from the original on 23 January 2013. Retrieved 6 December 2009. 1 2 3 4 "Delwende (2005)" . Retrieved 20 November 2016. This article related to Burkinabé film is a stub. You can help Wikipedia by expanding it.